Do you know about Sunnyhill Saturday firepits? Every Saturday, as soon as snow melts, if it’s not hailing and raining–and sometimes even when it’s raining–we firepit on the Common. Share food, char some meat. Talk. Play Scrabble. Drink. Watch our kids play and run and laugh. And that is what we are doing tonight–we desperately need a shot of NORMAL, and we need to celebrate and not feel guilty about not working. And all of you–you, you, you, and especially you–need to come and celebrate the wonder that is you with us. 6 p.m. Sunnyhill Common. We light the fire. Come. Bring food and drink if you’ve got something to share; if you’re exhausted and the thought of another task paralyzes you (I’m talking to *you*–I’ve seen how you can barely stand straight), just COME and let others feed you. That’s what a co-operative, a community does. We have so much to celebrate, too, and we will–all 38 units got a “D” slapped on them yesterday. “D” for “done”: thoroughly gutted, scraped, swept (and re-swept), bleached (and re-bleached), and anti-molded. But our people are exhausted. We were all hitting walls yesterday–wandering around aimlessly, zoning out, crying, accomplishing very little. Ripping out the drywall was, suddenly, the easy part! What next? We need some help thinking and planning, so when you come down today, look, assess and get your neurones firing. We’re done racing against the clock–the next phase will be unfolding over weeks and months. – Loading up the mountains of mud from Sunnyhill Lane into wheelbarrows and taking them… where? Not a clue. Help us figure this out. Most of our members are for the first time looking at their “salvaged” possessions and trying to figure out how to clean them and where to put them. There will be a need a for help with that as well. We would love to see you out; if you come, we will find you a task. BUT. High River goes home for the first time today. And they’ll be racing against the clock. Morley is fucked, and not getting nearly enough hands. And people in Mission are still fighting the water. Check yychelps.ca, and go. We’ve also been hearing, about Bowness, that although there are armies of volunteers, they’re often being sent home or their tasks cancelled–and then hearing from others that there is so much work to be done, but the home-owners and residents are just too exhausted to organize and coordinate and think. We so get that. And that will happen in other areas. 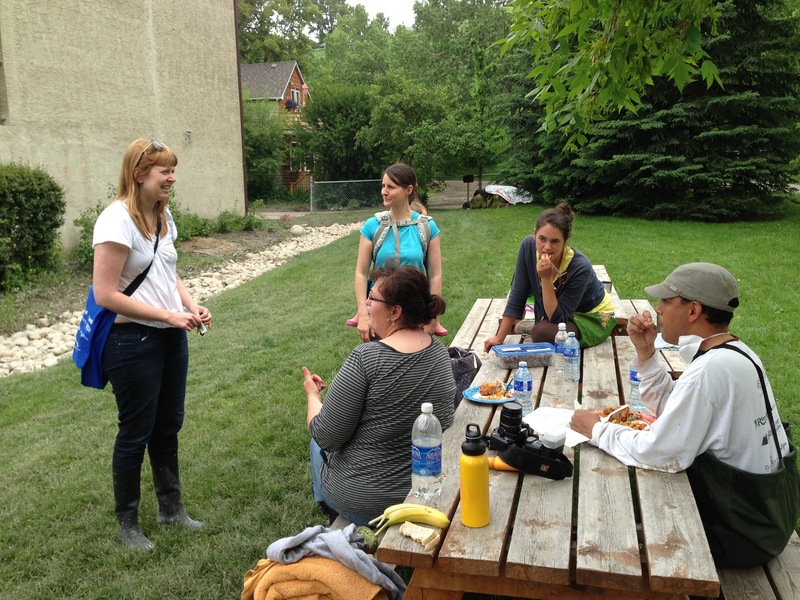 So if you can’t travel to High River or Morley, come to Sunnyhill to get trained up on the exterior clean up that the gutted neighbourhoods need–and then you’ll be able to go down their streets and lanes without needing to ask the residents what they need. And babes, if you’ve been sprinting with us for the past week–I know how you feel. Take a day off. See your friends and family. Do something normal. The race against the clock is over–and for the marathon that follows, we need to pace. And, don’t forget, we need to party. The fire will be lit at Sunnyhill at 6 p.m.